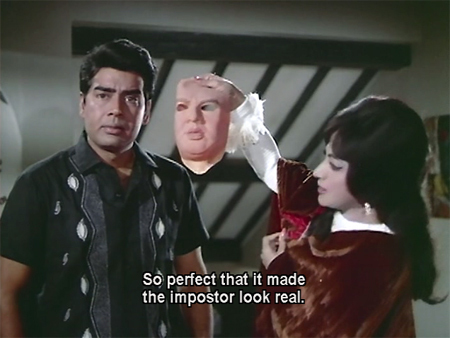 Even Dharmendra is faintly boring (possibly because he has no chemistry with Mala Sinha). 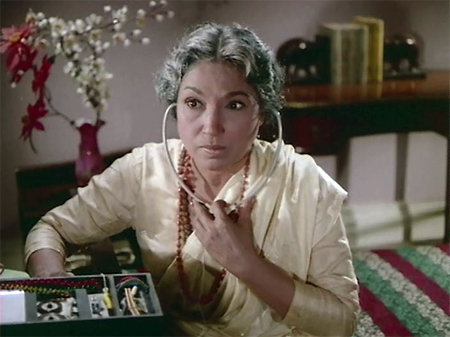 My favorite person in this is Lalita Pawar as Madame-Fake Auntyji, but she doesn’t really have much to do until two-thirds of the way through. It is somehow lacking the gleeful “I have no budget but that won’t stop me!” ambition which characterizes other films of the genre. Perhaps having actual funds (Ramanand Sagar made it) precludes the crazy jugaad that ensures a high level of entertainment no matter how bad the end result. In any case, I have seen it quite a few times now and am hoping that by writing it up I will now remember that fact. Certainly it is worth watching: the songs alone make it so, but it also has lovely locations in Beirut, Kerala and Japan, and it’s well done; the plot hangs together (mostly) and the cast is solid if not scintillating. I love the title screen: it is so layered. Major Sahab (Nazir Hussein) is a former fighter under Subhash Chandra Bose, a fact which makes him very proud indeed. He and some of his old soldier friends have formed a civilian (ie non-governmental) group to protect apna desh from traitors who want to destroy her by inciting communal unrest with the aid of smuggled bombs and guns. The Major’s son Sunil (Dharmendra) is part of this group as are the two sons of one of the Major’s closest friends. Unbeknownst to everyone, one of these sons, Akram, has been seduced by the love of a girl named Lily (Daisy Irani), into betraying them. Love him, Lily! Love him! Lily is part of a gang led by Doctor X (Jeevan), Captain (Madan Puri) and Madame (Lalita Pawar) whose political agenda remains somewhat mysterious to me. They are in cahoots with other external (to India) agencies of evil, and they maintain an elaborate underground labyrinth rigged with explosives as security against being caught. I can already visualize the movie’s ending! 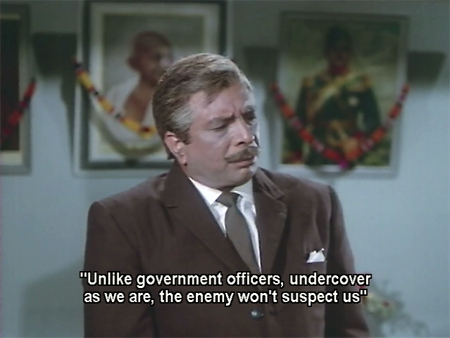 the Major sends Sunil to Beirut, from where he suspects the arms shipments are being sent. He informs Sunil that there are reinforcements waiting there in the form of Meenakshi Mehta (Mala Sinha) and another old soldier’s son, Nadeem (Sujit Kumar, who sadly passed away recently). 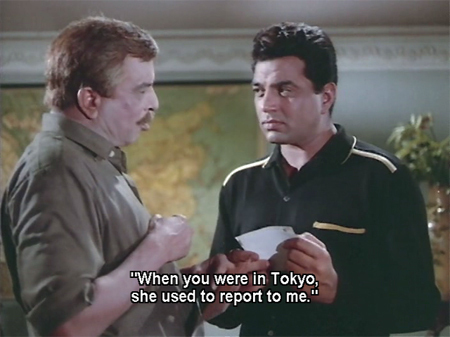 Sunil—as we have seen through flashback—is already acquainted with Meenakshi after she basically stalked him in Japan, where he had gone for training. She is half-Indian, half-Japanese and wholly determined to make Sunil HERS. He is not as creeped out by this as he might be (she informs him that she took a job at the post office in order to read his mail!) and she does sing him a lovely lovely song (“Milti Hai Zindagi Mein”), but he is reluctant to get involved romantically with anyone because his life’s work is so fraught with danger. Still, he looks pleased at the prospect of seeing Meenakshi again even after he finds out that she’s been spying for his dad for a long time (of course she is also the offspring of one of the Major’s old compadres). In Beirut, Meenakshi’s cohorts include Madhumati, Mehmood and Dhumal but not Nadeem: he is acquainted with Meenakshi, but is unaware of her links to Major Sahab’s organization. She and Madhu are working as dancers in a club owned by Mr. Syed (Sajjan), also known as Boss, whom they suspect of nefarious activities. A fabulous song and dance ensues, with Meenakshi using her microphone to snap photos of the crowd, which includes a gori extra playing a French spy who is murdered by Syed at the end of the cabaret. It is probably the BEST EXTRA role EVER. I would be a French-spy-murder-victim in a heartbeat if someone asked me! Seriously, I could handle that. Anyway, Meenakshi and company receive word from the Major that Sunil is on his way and it’s Meenakshi’s turn to be pleased at the impending reunion. Sunil is met at the airport by Nadeem, whom we know has been keeping cosy company with the Boss and has bugged Sunil’s hotel room. 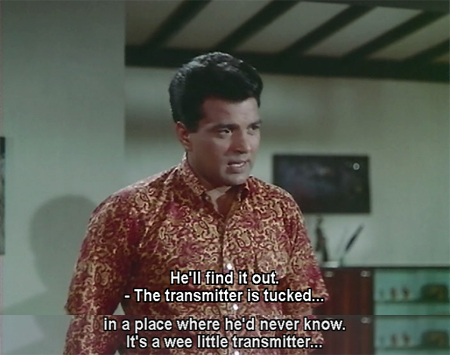 Sunil, being Dharmendra and therefore the Most Awesome Spy Ever, soon finds the listening devices after checking in; then he notices that he is being trailed wherever he goes by none other than Ram Tipnis (aka Papa Ajoba, makeup man extraordinaire). 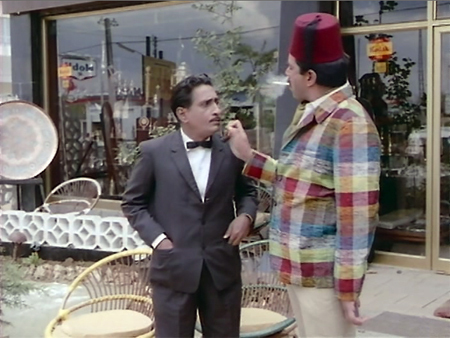 Sunil manages to lose him by buying the fez off his waiter in a coffee shop and turning his beige jacket inside out, but he is troubled by the fact that the enemy clearly knew he was coming. 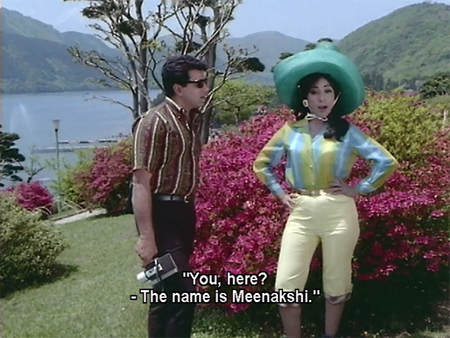 He meets Meenakshi (there is *almost* some romantic tension!) along with Mehmood, and asks them if Nadeem is completely trustworthy. Both assure him that he is, using one of my favorite Hinglish idioms. More intrigue ensues, with poor Ram Tipnis continuing to be fooled by Sunil’s bad disguises, plus another femme fatale is introduced in the form of Algerian Princess Zenab (Zeb Rehman). Sunil continues to keep an eye on the suave Nadeem, especially after he discovers that Nadeem hangs out with Syed and the Princess (he hilariously uses a magnifying glass to peer at a large photograph). He and Meenakshi follow Nadeem and some other guys with machine guns to a ruined fort in the harbor. There, they discover that the real Nadeem has been held captive there while his lookalike has been hand in glove with the enemy. They rescue him and I am pleased to see Meenakshi wielding her machine gun with aplomb in white high heels and tight red trousers. They further blow up the ammunitions cache inside the ancient historic monument so that Syed and company will think that the real Nadeem has died in an accidental blast. They replace the fake Nadeem (now under arrest) with the real one in Syed’s gang. Sunil decides that he too will go into the lion’s den (almost literally: Syed’s code name is African Tiger) (Doctor X’s is Napoleon) and he shows Nadeem and Meenakshi a tracking device on which a needle will point to him as long as he is in a five mile range. Meanwhile, in India things aren’t going so well for Doctor X and his gang. In the wake of Salim’s murder, the Major is not sharing his secrets with the larger group, so Akram’s information has dried up. Sunil’s sister Sunanda (Kum Kum) is living at the Major’s house with her son Babloo while her husband is abroad. Doctor X kidnaps little Babloo from his birthday party (the humanity!). 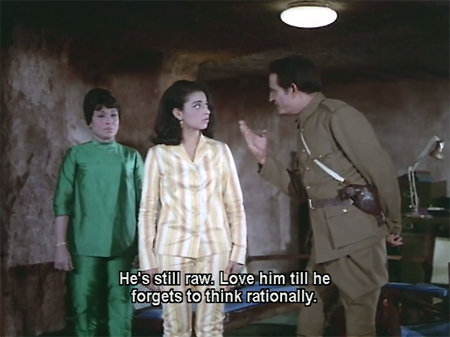 With her son held captive, Sunanda is forced to introduce Madame into the Major’s household as her husband’s mausi (on the pretext that she has come to comfort the family in the wake of Babloo’s disappearance). 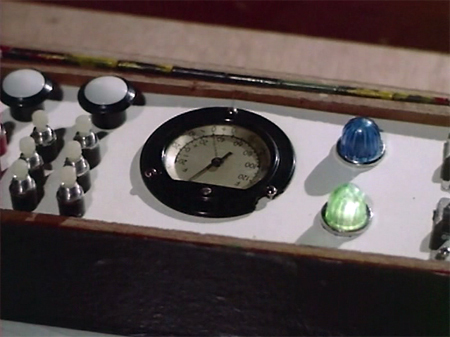 Madame has soon tapped into the Major’s own secret radio communications. 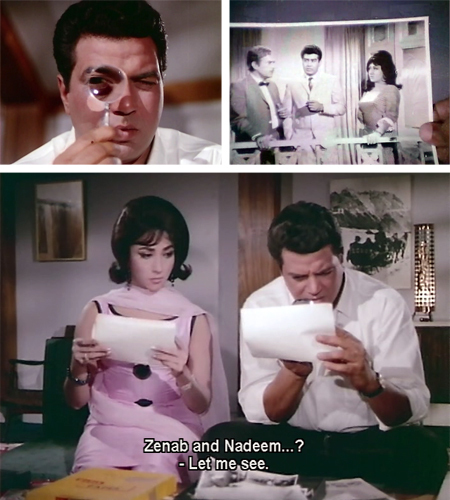 Doctor X and thus of course Syed are now privy to every plan that Sunil and Meenakshi devise, and Sunil is captured after he receives a microfilm with a map of Doctor X’s lair in India from Princess Zenab, who has fallen so in love with him (he IS Dharmendra) that she betrays Syed. Will the Major discover the spy he is now harboring in the very bosom of his family? Can Meenakshi and Nadeem and their friends rescue Sunil? Will that poor needle be able to locate him? Will Babloo survive his harrowing imprisonment? Looking back at this post and screencaps, I have to wonder myself why this film hasn’t imprinted itself on my brain by now. It’s a fun film without doubt, and I really have no criticism of it at all. 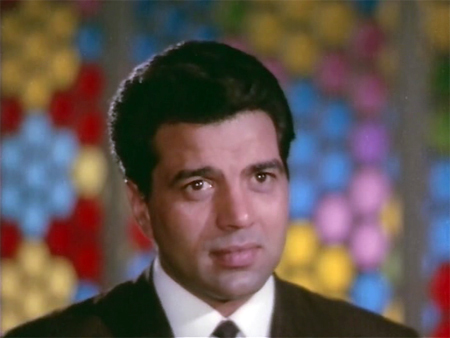 Dharmendra is his usual suave, handsome self. 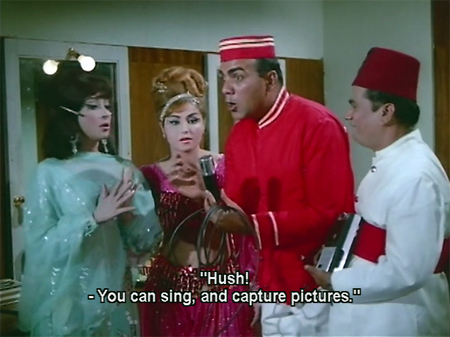 Even Mehmood and Dhumal are fairly restrained and entertaining, and there’s a tiger and Hiralal as a Sheikh! Mala is lovely and doesn’t overact either, and although she and Dharmendra are lukewarm together romance is not the focus of this movie. And the songs are wonderful wonderful wonderful. So why hasn’t it been memorable for me? I have no real answers for that, except…maybe…my daily masala requirements are out of control. Posted on April 1, 2010 at 10:06 am in Hindi movies	| RSS feed You can skip to the end and leave a reply. I adore this movie and really need to see it again! When I first saw it, back in my infant Bollywood days, it was my introduction to Mala Sinha and she quickly became a favorite of mine simply because of the coolness of this film! And although I only own one copy of the DVD, I do have more then one movie poster from the film! Dharmendra I was already acquainted with, and that is likely the reason I had bought this DVD in the first place. I had forgotten that my love Kum Kum is in it which is one reason I need to watch again. I totally “heart” Kum Kum! I know you totally *heart* KK ;-) She spends a lot of time weeping in this but I guess if my little boy was trapped between two movable spiked walls I might too. I’m not a huge fan of Mala but she’s benign here, although I would have replaced her with Mumtaz or Sharmila, and replaced Madhumati with Helen or Laxmi or Bela :) I’m predictable! Its a good post. But remember, this movie released before Aradhana (1969) and catapulted Dharmendra to the top league. His other hit of 1968 was ‘Shikar’ which was a Golden Jubilee hit. Dharmendra and Mala Sinha were a popular pair in the 1960s. They starred together in ‘Anpadh’, ‘Pooja Ke Phool’, ‘Neela Akash’, ‘Baharein Phir Bhi Aayengi’, ‘Jab yaad kisi ki aati hai’ before ‘Aankhen’. So I am not sure if there chemistry was non-existent. You used the word “jugaad”! And that too exactly in the right context ! I remember seeing Aankhen many years ago. I didn’t remember much of the story except that it was a spy story and that it had lovely songs. 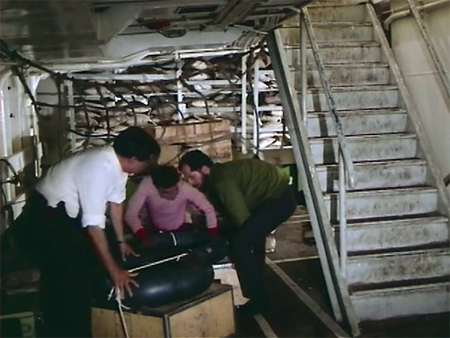 I think one of the reasons you may not consider this a “memorable” movie for you is that these sort of spy movies tend to induce a feeling, somewhere 80% into the movie, of “ok, I think I am now ready for the end”. At least that is how I feel with such movies. I had exactly the same type of feeling with April Fool. Another movie with lovely songs. And the spy-story was not all that bad either. But somehow I got that 80% should be FF-ed to 100% feeling. I think that you might be right…if there is nothing really eye-blastingly crazy (or bad) it gets dull after a while. There are only so many beeping gadgets that one can endure before they get old. Mala Sinha is wonderful in this, though – at least through the first half. I don’t remember much of the story, had seen it around 11 years back but I do remember watching it. Just the mention of this film reminds me of Milti hai zindagi mein and Meenakshi wielding her machine gun with aplomb in white high heels and tight red trousers. But “well-appointed” is kind of a perfect way to put my feeling about it. There are some delightfully silly things about it…but it never strays above silly into loony territory. Might as well just be a Bond film! I totally agree to Todd…. These type of films are always better when they’re cheap, wrecklessly made and crazy Spy in Rome was a different experience altogether!!! It was so cheap and so silly, I couldn’t help laughing throughout – was a total bakwaas. Needed suspension of everything while watching it but it was entertaining at the same time. One of the craziest movies I have ever seen and a movie I will never ever forget. I totally need to see Spy In Rome!!!! Please translate “jugaad” as I can’t find it in my Oxford Hindi-English dictionary. Thanks! Many thanks! New vocabulary word AND cultural concept!! The word “jugaad” as described here is not how it is understood by desi persons like me. I do not agree that “jugaad” is a word describibgly a uniquely India/ Africa/ Third world human behaviour..
“Jugaad” stands for “connections” which is the same in any part of the word. Main kuch “jugaad ” lagaataa hoon = Let me make use of my connections. Memsaab ka Bollywood mein “jugaad” hai = Memsaab has connections in Bollywood. The activities that are described as constituting “jugaad” in the link are more like “native ingenuity/ making do with whatever one has. “Jugaad” is basically cutting rad tape / getting doors opened quicker by making use of connections/ one’s charm. “Jugaad” that way is nothing but “resourcefulness”. Part of what I love about the post I linked to is the discussion in the comments following it among Indians as to how they view it. If you are waitlisted on train and you need to travel on it, you indeed need connections (to know the person who allots tickets under VIP quota- there is one such quota where people can get confirmed berths irrespective of their wait list). This is indeed “jugaad”, and this “jugaad” indeed means using one’s connections/ influence/charms. Thanks for this interesting discussion. My Hindi teacher always speaks about how the language is inseparable from culture, and this is a great example. I remember Aankhen very well since I saw it last weekend. And I was thinking, Memsaab should review this and as if by ESP you listened and voila! I liked the movie a lot–it made it to my top 20 Dharmendra flicks. For one thing Mala was part of the action as opposed to being a support. I haven’t liked her in the least so far but because of this fact alone, I hereby retract all the bad things I have said about her. Also, it’s always nice to see one’s hero so admired. 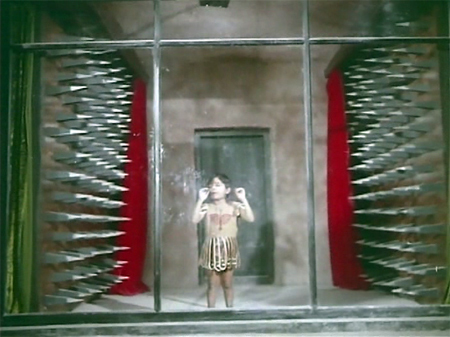 In this case, Dharam has not one but two ardent stalkers. The English subtitles (erroneously) have Zenab say he is drop dead gorgeous. And he is and then she dies. So I liked this role reversal–the girls going after the guy. We see so little of it in Bolly. I have a low libido as far as masala requirements and was ok with the fact that the biggest ambition of this movie was to reconfigure Bond for the Indian audience and to show Dharmendra in Tokyo and Beirut travelogue style. In 1969, I’d have gone to the movies for that alone. Also, if anyone is a Sujit Kumar fan (I didn’t think so) this is the best I have ever seen him look. I wondered more than once if it was actually him. I love Sujit Kumar!!!! Seriously! It was kind of nice to see him as both a good guy AND a bad guy here. And I always think that he is a very striking looking man, even as he aged. As for the film itself, the part that excited me was Mala wielding a gun in heels and tight pants. We may ridicule bad films but they succeed in leaving an impression. Who can forget they saw ‘zinda dil’? i guess these lines (by Sahir) from the title were quite popular cause my father and his buddies often like to quote it when they get together and talk about old times. And I was thinking of putting together the paintings from title credits of various BR Films. Oh that’s so interesting! Thanks :) Love this painting, love Indian miniature paintings of all schools in fact. I crown thee Punjaban No 1 for using the word Jugaad. The songs were great, but the movie lacks a bit of bombast. Yes, exactly :) Bombast, that’s it! I love the raw silk suits worn by Lily and Madam. Chinese connotations? It sounds like a fun movie. I remember seeing one scene with Lily. But must watch it. I thought they were pyjamas and the scene showed that they just got up from the bed and Madame and Lily are mom and daughter! Yes—I remember Madame’s green silk Chinese suit in particular, it was quite lovely. 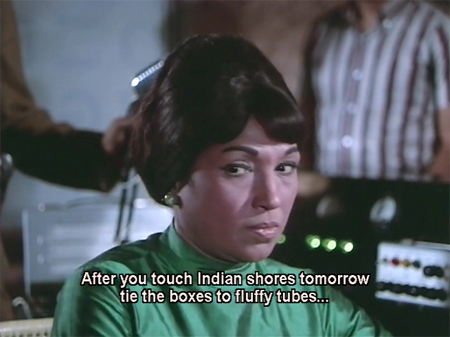 Lalita looked really beautiful in this film after she got out of the horrible Madame wigs and into her Fake Aunty mode. It’s a good film Banno, you should watch it. Would love to hear your take on it afterwards. Well, don’t know anyone who Pradeep Kumar had chemistry with :) so, good pair, I’d say. Harvey, yes maybe, Lily’s suit does look like pyjamas with the stripes :) But not Madame’s green. Pradeep kumar and chemistry is something historical! u r right, madame’s green suit is surely her uniform. Poor thing! They could have added a flower or sequins. And they allowed only a single ornament: the tragedy of all, the cyanide capsule! Yes, this movie is also directed by Ramanand Sagar. I just loved her for the role her! She made the whole film worthwhile. a revolutionary movie for the 60s! Change of gender roles! Wow! Although I saw the movie in my teens, I still remember Mala Sinha’s grin, when she sees Dharmendra on the micro-film on/behind the stamp! The famous Devyani Chaubhal wrote int he 80s in Star & Style that Ramanand Sagar was having an affair with Kum Kum at that time and his wife got along with Kum Kum quite well! Yup, Lalita was my favorite part of the film. It’s funny though, I didn’t see the females stalking Dharmendra as that different from lots of Indian films…I think women often take the initiative in Hindi movies! Maybe I will need to do a separate post about that someday, but I am often struck by how aggressive females are in pursuing their love interests, even though they are quite repressed otherwise. You are right! But in the 60s it wasn’t that common, was it? I remember movie plots with the heroine stalking the hero only form the late 60s! But it is quite possible that my memory is playing tricks on me. Harvey we love daily doses of filimi gossip (particularly where Dharam is concerned). I have been wondering for some time which of his co-stars (other than Hema/Meena) he had affairs with. 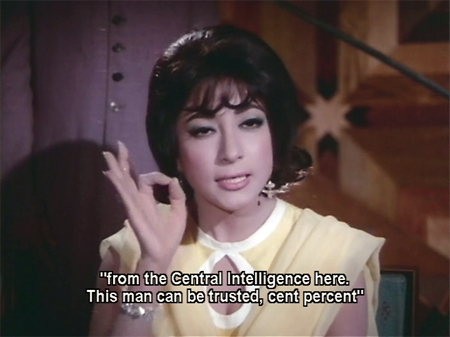 And for some reason, if I had to make a list of possible candidates, Mala Sinha and Rakhi would be the ones I’d think. @sophy: an uncle of mine would always gossip that Dharam had an affair with Saira Banu and in fact she was even expecting a child from him and Dilip Kumar forced her to abort it! But knowing how Dharamendra talks highly of DK (Dilip Kumar not Donna Karen), I think it is highly improbable! But who knows? “Meh” is the word that comes to mind and fills the heart when I think about “Aankhen.” And unlike you, I feel that way about every aspect of the movie, including the songs. Sahir’s lyrics are superb as always, but Ravi’s compositions(also, as always) are dull, dull, dull! @Harvey – the other actress w/Shobha is Azra and the singer is the underrated Sudha Malhotra. The song is from “Babar”, the first collaboration between Roshan and Sahir. Okay I like mint and fennel too so we can still be friends, ha ha :) Maybe it’s a difference in how I hear things—I don’t focus as much on individual singers’ phrasing, etc. (or the lyrics, obviously, although when they stand out and are well-translated I do) but more on the melody, just because that’s how I tend to listen to western music too. Plus I confess that all Indian female singers anyway tend to sound alike to me (sacrilege I know!). The men I can tell apart more, not sure why. What can I do? In any case I am probably a less well-rounded “listener” than most Indians. I too love Ravi’s compostions! But his songs in Aankhen are for not his best ones. thanks for this lovely song, shalini! Who is the other actress in the song. Shubha Khote looks lovely as usual! Who is the singer? Cilantro is wonderful! In India I would put coriander green on nearly everything edible, maybe except sweets! Ravi is an underrated music director. In reality, Ravi is the one music director who has composed music for the longest duration (1955 to 1989). If one makes a list of iconic songs of Bollywood music, half the songs will be Ravi’s. You have done my list for me! :) He wrote beautiful music for some pretty bad movies. But I suppose that is true of all music directors in Hindi cinema! I have included just one song per movie. In reality, Ravi gave a clutch of hit songs in each of his movies. That is just a crazy visual for me of Ravi squatting over a nest and laying musical eggs. Poor guy. But I agree with you wholeheartedly—great music director :) His musical eggs were of the Faberge variety! ps: Lalita Pawar in a green pant suit??!! how awesome is that!! I am happy to be part of a dream sequence :) As long as I don’t have to do anything but watch a cabaret number and then get shot and lie in a pool of spreading blood, I am IN. Memsaab, tks for Ankhen posts. Mala Sinha so goregous, Dharm beautifulll!! Age of Innocence. I have yet to see any heroine of Mala’s Chrisma. WHAT A BEAUTY…and tks for Ravi’s list of songs…Love each and every song posted here. I heard these songs in the next couple years after being released, OH Radio Kashmir and Radio Ceylon…Remember those days being 9/10…I really do wish they would have another Mala Sinha, but it doesn’t look like it…feel bad that Pratibha didn’t succeed after beautiful talented Mom…. God bless her where ever the beautiful lady is!!! I love this film to bits – every flashing light and face mask and everything else in it. It has all my favorite masala elements (including cilantro! ;-D) mixed in exactly the right proportion and super suave Garam Dharam. If that isnt enough, there are International beggars, too. Yeh dil does not maange more! You could be right re: Dharam, although he is definitely second—maybe closer than I will admit, but still second—to my Shammi. Any relation to Doctor X the movie? Was that a sequel? I saw this movie recently too. Yes, memsaab, it works well as a spy flick considering ‘those days’ but the film needed a Hema malini or a Rekha to enliven the romantic proceedings although this is still Mala sinha’s one of the finest roles ever..
Hi Greta, if you still have a copy of this film can you please give me a a nice close up pf Daisy Irani without subtitles. Similarly if you have the colored version of Naya Daur, could you get a capture from there when she was a kid. Thanks. 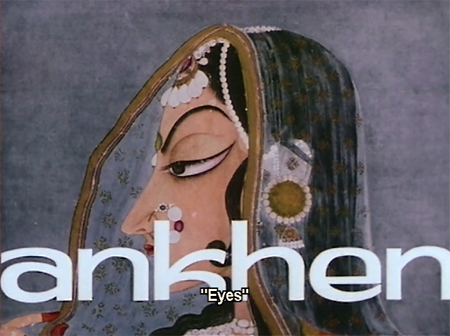 ANKHEN1968,but I personaly saw this movie on its rerelease in1973 when IT had began to understand cinema, if this was 1968,it shound have coincided with BAAZI 1967,YAKEEN 1969, and KAB? KYON?AUR KHAAN?1970,all three we’re suspence thrilers,had another thing in comen,our own respected DHARAM uncle,apart from this triolgy,the other three though cannot be classified into suspence/thrilers,but in there own way into being thrilers,and they were DO CHOR 1972,KEEMAT1973 and last one CHARAS1976,all six were hugely succesful ,with super hit music.Back to this movie ANKHEN was takeoff from James Bond movie,with unique indian way by sagars,though in my mind when I see this movie now,or to last few years I Will edit about three songs from movie to make it more pacy, Respected DHARAM gave one of their best performance,not to forget that this was their first outing with SAGARS which was further carried to so many movies,I can also figure out that apart from Dharam uncle,late Sujeet uncle,Mala aunty,Kum Kum aunty,and Rajinder uncle use to intergal part of SAGARS camp,not to forget late Nazir Hussainda.Not many people that right from begning of Dharam uncles career ,from his first movie to their last movie Late nazir hussain,and Rehmanda,they were intergal part of Dharam uncles movie,inthere case last movie was RAJPUT april 1982.Personaly I feel that despite height being hindernes somewhat but noway this came inbetween of her being full of exuberence,magical and bombastic,in three movies of her,namely,NIGHT IN LONDON 1967/68,ANKHEN1968,and third one being BEWQOOF1960 I suppose,this movie too can be counted as cult classic,fourty five after its release,even today it can be watched with same zest.RAVINDER MINHAS,JALANDHAR CITY,PANJAB,minhas35@yahoo.com. GreAt movie. Excellent songs… mala sinha was beautiful and acted well. Dharamendra is just there.